shot the full moon yesterday during the 'Supermoon'. saturated the colours. though exaggerated, the colours are real. 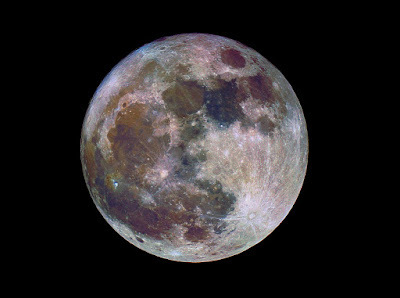 the different colors show the differences in the chemical makeup of the lunar surface - blue hues reveal titanium rich areas while orange and purple colors show regions relatively poor in titanium and iron. Shot prime focus through Celestron Nexstar 4" telescope. Nikon D90. Focal Length: 1325mm. Stack of 35 stills. 1/400@ISO400. 19-3-2011. Nice shot. I saw the same moon with my naked eyes. Now I know what I missed.